On June 23, 1967, President Lyndon B. Johnson attended a $500-a-plate Democratic Party fundraiser at the Century Plaza Hotel in Century City. 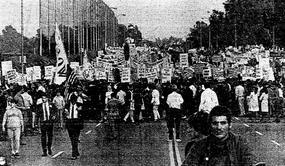 A peaceful anti-Vietnam War demonstration assembled outside the hotel; I was one among approximately 10,000 protesters — representing groups ranging from Another Mother for Peace to Students for a Democratic Society to Trotsky groups. Lined up in front of the hotel were some 1,300 LAPD officers, sunlight gleaming off their metal helmets. I had a sinking feeling in my stomach as the police bullhorns urged us to disperse; I turned to a friend and pointed to one particularly burly cop: there’s going to be trouble and he’s the first one who’s going to start hitting people, I said. My friend demurred — that wouldn’t happen — there were women and children here. 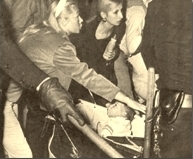 As the sun went down and evening fell, the nightstick-wielding police — using a parade permit and court order that restricted the marchers from stopping to demonstrate — waded into the crowd, pushing us into a vacant lot that later became the ABC Entertainment Center and is now the CAA building. In their wake they left scores of protesters bloodied and hurt; 51 were arrested. This was a turning point in the peaceful anti-Vietnam War movement; the protest mobilized more students and groups and bigger demonstrations, but it also augured more violent confrontations between demonstrators and police around the country. Some 40 years later, the famed Century Plaza Hotel is on the demolition block. According to the Los Angeles Conservancy, in December 2008 the owners of the Century Plaza Hotel (designed by Minoru Yamasaki, 1966) announced plans to raze the building and replace it with two 600-foot towers. The new project would include a boutique hotel, condominiums, and mixed-use space, plus two acres of open space. The venerable hotel received a $36 million facelift less than a year ago. On April 28, 2009, the National Trust for Historic Preservation named the Century Plaza Hotel in Century City to its 2009 list of America’s 11 Most Endangered Historic Places. This annual list highlights historic places throughout the U.S. that face destruction or irreparable damage. We need as many people as possible to write the Planning Department to let them know that the Century Plaza Hotel is a significant cultural resource and should be treated as such in the City of Los Angeles Planning Department’s environmental impact report (EIR). If you believe that the site can be made more pedestrian friendly without razing the hotel (as we do, and as envisioned in the Greening of Century City Plan), please mention that as well. We’re shooting for 200 letters or e-mails, and you can help us get there! By e-mail: Jimmy.Liao@lacity.org; copy: centuryplaza@laconservancy.org. Copy: Los Angeles Conservancy, Attn: Century Plaza, 523 West Sixth Street, Suite 826, Los Angeles, CA 90014; fax (213) 623-3909. For more ways to help, jump on over to the Los Angeles Conservancy’s website action page on the Century Plaza Hotel.